Karen L Messick Photography: Getting out....about grab shots....take them! Getting out....about grab shots....take them! I was reminded the other day by a follower of my blog that I had not posted for quite some time...to which I replied.."Oh you noticed?" well he said, "I just figured you have been busy and that's a good thing." Truth is I have been busy. I spent the entire month of May tethered to the house while my only full bathroom underwent a renovation down to the wall studs and floor boards. In the evening I ran out to the gym every day to shower. The the first week of June I had guests at the beach house for a week. So for one entire month I did not make a single frame of "Big Camera" images and I only used my iPhone in the garden during the day when the construction workers were here. However this past week I have been out shooting with my morning field workshops sponsored by Capital Photography Center. Kenilworth Aquatic Gardens was the first workshop this past weekend and all my shots there were handheld using the my D4 and the Nikon 28-300 lens. The lens is not great (its a little soft, has chromatic aberrations, distortion and vignetting) all of which can be adjusted except for the softness, but it allows me a degree of variability to help workshop students find compositions without me lugging a lot of gear into the field, changing lenses and slowing down the education process. It is not possible to really take time for personal shooting while teaching but whatever grab shots I get; I sort through and try to brush up to an acceptable result. This shot, the last one I made that day, happened to be a favorite. All but the green lily bud was submerged under the water and I really enjoyed the distortion effect the water created. The natural arrangement of the spray of stems, and the colors of the pond water as a background worked for me. 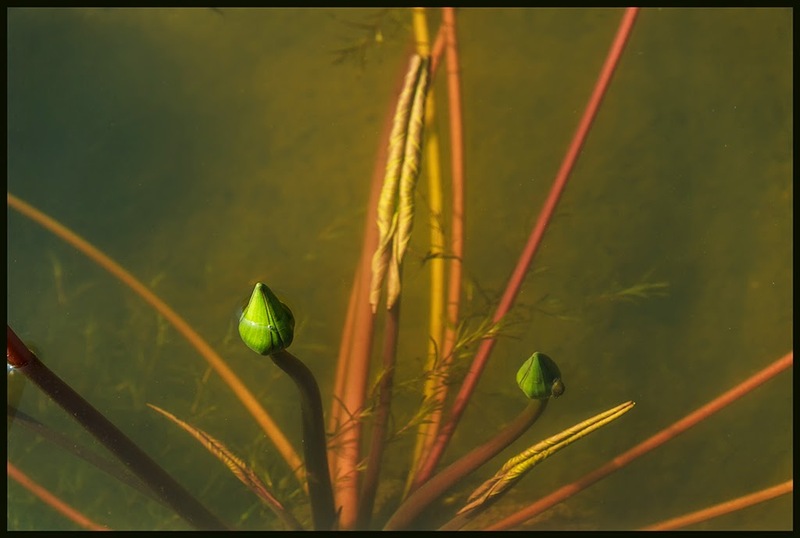 It was a bold sunny day so the stems and leaves under the water were illuminated. While shooting with a polarizing filter, I demonstrated the power of a polarizing filter to cut glare from the waters surface. After making adjustments to the photo image file I ran it through Snap Art 4 and applied a painterly filter. I am heading out west to do some personal shooting before my Palouse Photo tour gets started. So hopefully I will get back to making a few more posts! Thanks for following! Hope to see you in the field!